These little bite-sized pieces of sugary gingery delight have become a high-rotation of mine ours. They are super easy to make (and just as easy to eat, which isn’t always a good thing). 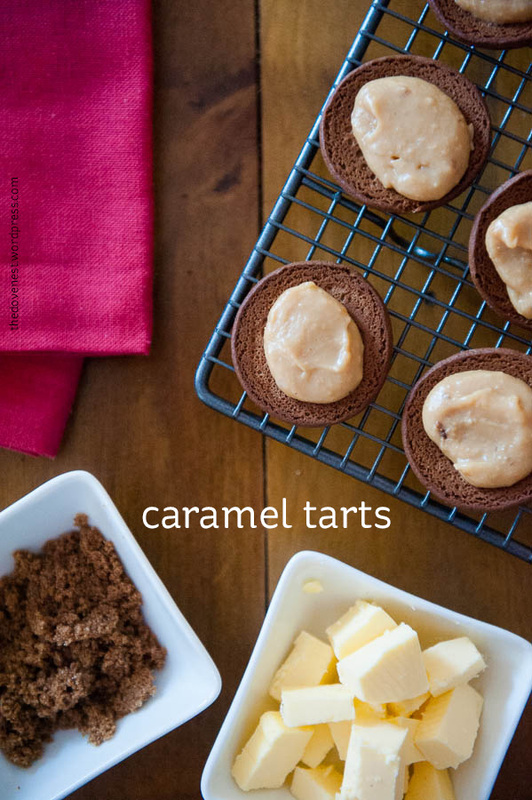 I use dark brown sugar in this recipe because I prefer the richer taste it adds to the caramel, but normal brown sugar will work just as well. Place biscuits in pattycake tray/mini muffin tray. Fight off the hovering small people for the leftover biscuits. Pop the trays of biscuits into the oven heated to 160 degrees. Combine in a small saucepan the condensed milk, sugar, and butter. Stir constantly over a medium heat. Convince yourself it is close to done and requires testing the second the butter is melted. Attempt to not burn your tongue. Attempt to not curse when you do burn your tongue. Continue stirring until thickened and starting to pull away from the sides of the pan. Remove biscuits from oven, and working quickly, use a spoon to press into a dish shape, or shape in your hand using a tea towel. I found 6 at a time was enough to work with, the last one was getting cool enough to start cracking. Drop a generous teaspoon of caramel onto each biscuit, and chill. Sneak tastes of the leftover caramel while you wait whenever the small people aren’t looking. Attempt to not eat them all in one sitting. Ooooo, I’m a sucker for a good cheesecake. Thanks for stopping by! They really are. And they seem to disappear far too quickly! I tried to make something similar at Christmas but my biscuit bases were a disaster. Your recipe looks great though! Will have to try it out. I check them quite a lot, and then mold in batches of 6. I also don’t stress too much if they crack slightly, as the caramel is thick enough it doesn’t drip through. Let me know how you get on!